Antipseudomonal carbapenems have played a useful role in our antimicrobial armamentarium for 20 years. However, a review of their use during that period creates concern that their clinical effectiveness is critically dependent on attainment of an appropriate dosing range. Unfortunately, adequate carbapenem dosing is missed for many reasons, including benefit/risk misconceptions, a narrow therapeutic window for imipenem and meropenem (due to an increased rate of seizures at higher doses), increasingly resistant pathogens requiring higher doses than are typically given, and cost containment issues that may limit their use. To improve the use of carbapenems, several initiatives should be considered: increase awareness about appropriate treatment with carbapenems across hospital departments; determine optimal dosing regimens for settings where multidrug resistant organisms are more likely encountered; use of, or combination with, an alternative antimicrobial agent having more favorable pharmacokinetic, pharmacodynamic, or adverse event profile; and administer a newer carbapenem with lower propensity for resistance development (for example, reduced expression of efflux pumps or greater stability against carbapenemases). Antipseudomonal carbapenems have proven to be valuable in the treatment of serious Gram-negative and polymicrobial mixed aerobic and anaerobic infections. In their two-decade history, imipenem and meropenem have primarily been used to treat intractable, severe infections. Although relatively rare at present, microbial resistance to carbapenems has reached clinically important levels for several organisms, including Pseudomonas aeruginosa, Acinetobacter spp., Klebsiella spp., and Escherichia coli. Carbapenem resistance can have a devastating impact because these agents often act as the last line of defense against resistant organisms. It is increasingly clear that the clinical efficacy of carbapenems, particularly imipenem and meropenem, is critically dependent on optimal dosing, especially in intensive care units (ICUs), burn units, and extended care facilities where multiresistant organisms are frequently encountered. Empiric treatment to cover multiresistant pathogens may necessitate using regimens at the higher end of the dosage range; however, the use of such high doses may be problematic in practice. For imipenem, the dose-dependent risk of neurotoxicity and seizure adverse events has led to recommendations for caution in using high-dose regimens [1–4]. Similar concerns may apply to meropenem, which has also been associated with an increased seizure risk [3, 5–7]. Higher doses of carbapenems generally come at higher acquisition costs, while use of lower doses may increase the risk of treatment failure. Furthermore, suboptimal dosing is a well known driver for the development of antibiotic resistance during antibiotic therapy . Appropriate dosing therefore presents a serious therapeutic dilemma for clinicians who prescribe carbapenems as empiric treatment for seriously ill patients. This article explores the clinical impact of the relationship between carbapenem dosing and adverse event risks, pharmacodynamic-based dosing, and costs. It focuses on imipenem, meropenem, and doripenem, as they are more commonly used as empiric treatments for seriously ill patients in settings such as the ICU . Ertapenem has not been discussed in this context because its lack of activity against P. aeruginosa and Acinetobacter spp. typically precludes its consideration for such cases . Finally, it offers solutions to address this growing public health concern. An analysis of data from the National Nosocomial Infections Surveillance system between 1986 and 2003 examined trends in the epidemiology of Gram-negative infections in ICUs . While overall percentages of Gram-negative infections in ICU-treated pneumonias, surgical site infections, urinary tract infections, and bloodstream infections either remained similar or declined, significant increases were seen in infections caused by cephalosporin-resistant E. coli and Klebsiella pneumoniae (related to extended spectrum β-lactamase (ESBL)-producing strains), ceftazidime-resistant P. aeruginosa, imipenem-resistant P. aeruginosa, and isolates of Acinetobacter spp. resistant to amikacin, ceftazidime, or imipenem. The authors concluded that increase in the prevalence of multidrug resistance – usually defined as resistance to three or more of the antimicrobial agents antipseudomonal penicillins, antipseudomonal cephalosporins, fluoroquinolones, carbapenems, and the aminoglycosides [11, 12] – may be the greatest concern for Gram-negative bacilli associated with hospital-acquired infections . Antipseudomonal carbapenems – imipenem, meropenem and doripenem – have excellent activity against most strains of many bacterial species and are regarded as safe and generally well-tolerated. Because of their broad spectrum, the antipseudomonal carbapenems are often effective against organisms resistant to other antimicrobial agents and are frequently used as empiric therapy in the ICU for polymicrobial infections. Of note, these carbapenems are resistant to ESBLs, and so are of value in treating infections caused by ESBL-producing strains of Enterobacteriaceae. Antipseudomonal carbapenems are indicated for a variety of hospital-treated infections, including intra-abdominal, urinary tract, and skin and skin structure infections. They are prescribed by hospitalists, surgeons, intensivists, wound care specialists, and infectious disease physicians in ICUs, postoperative surgical units, burn units, and long-term care facilities. This use may not always adhere to manufacturer-specific dosage and prescribing practices aimed at minimizing the development of carbapenem resistance in an effective manner. In addition to empiric use of carbapenems, the use of this class for surgical prophylaxis has been proposed. While a recent study found a single prophylactic dose of ertapenem superior to cefotetan in colorectal surgery , the use of carbapenems for surgical prophylaxis remains controversial [13–16], and in the absence of more evidence favoring carbapenems for surgical prophylaxis, they are not recommended for use in this setting. Multiple studies have found that imipenem and meropenem are associated with a dose-related increase in the risk for seizure events [3, 4, 17–25]. The mechanism is not fully understood [3, 26, 27]. Table 1 summarizes the range of seizure rates reported with either imipenem or meropenem. In the largest report on seizures during imipenem treatment, underlying central nervous system disorders were common among patients who experienced seizures . In this study, seizures occurred in 1.5% (37/2,516) of patients, although only 0.24% (6/2,516) were considered to be imipenem-related. A more recent study found no increase in seizure risk for patients treated with imipenem at a maximum dose of 2 mg/day . The risk of seizures with meropenem is widely believed to be lower than with imipenem , but the evidence is not definitive [3, 6]. During clinical investigations, the overall seizure rate in meropenem-treated patients was 0.7% (20/2,904) , similar to the rate of 0.8% found in non-meningitis patients treated with meropenem . Doripenem does not appear to have proconvulsive activity . After more than a year in clinical use, there are no reports of doripenem-related seizures. Although imipenem- or meropenem-related seizures are usually reversible on discontinuation and are manageable with anticonvulsants, the risk has made clinicians cautious about using these drugs at high doses, and this caution may be associated with the setting of upper limits on the dosing window for these carbapenems that are sub-therapeutic. Imipenem, meropenem, and doripenem have elimination half-lives of approximately 1 hour [1, 28, 31]. Like other β-lactams, carbapenems have time-dependent bactericidal activity that results from avid binding to penicillin-binding proteins and disruption of bacterial cell wall synthesis. Carbapenems are highly resistant to most β-lactamases, including ESBLs . The key pharmacodynamic parameter is the time during which the carbapenem concentration exceeds the minimum inhibitory concentration (T > MIC), which should be at least 20% of the dosing interval for bacteriostatic effect and 40% for maximum killing effect [33, 34]. Dosing of carbapenems in the clinical setting must be carefully judged to give the best chance of meeting or exceeding the pharmacodynamic bactericidal T > MIC target of 40%. Critical factors to take into account must include the severity of infection, patient-specific pharmacokinetic considerations and their impact on the drug concentration curve over time, and an assessment of the most likely causative pathogens. As carbapenems are often given empirically, judgments on this last point should be made based on local experience and on local antibiogram trends. When dealing with seriously ill patients, the possible presence of P. aeruginosa or Acinetobacter spp. should be considered, in addition to resistant strains of Enterobacteriaceae (for example, ESBL-producing strains). The potentially higher MIC values associated with these species or strains will be a factor in carbapenem selection and in the appropriate dosing of the chosen carbapenem to ensure achievement of the T > MIC target for these difficult-to-treat organisms . Ideally, to help prevent the risk of under- or overdosing, clinicians who can obtain carbapenem serum levels may consider doing so in ICU patients. Carbapenems such as imipenem and meropenem have a relatively narrow therapeutic window. The upper limit of this window is bounded by the dose-dependent risk of seizure adverse events, while the lower limit is set by pharmacodynamics. Carbapenems require a T > MIC of at least 40% of their dosing interval for maximal bactericidal activity, and attainment of this pharmacodynamic target depends on dosage, individual patient pharmacokinetics, and the MIC of the target pathogen. Several studies suggest that low doses of some carbapenems are associated with decreased efficacy as reflected in failure of cure, relapse, and superinfections, especially when the infection involves species with high levels of resistance (for example, high percentage of pseudomonal isolates with MICs >4), such as P. aeruginosa. In patients with soft tissue infections, a 2 g/day regimen of imipenem provided a response rate of 95% (56% clinical cure, 38% improvement). Rates of microbiologic eradication ranged from 61% for P. aeruginosa to 100% for anaerobic bacteria . In patients with febrile neutropenia, a study using the 2 g/day imipenem regimen reported a 77% response rate . In patients with intra-abdominal infections, reported cure rates at the 2 g/day dosage range from 76% to 81% [38–40], and at a lower dosage (1.5 g/day in three 500-mg infusions 8 hours apart), the cure rate was 69% . In the absence of controlled trials comparing different imipenem doses, these data suggest that imipenem 2 g/day, which minimizes the incidence of seizure adverse events, may be less effective than 4 g/day. Thus, the need for a relatively low dose of imi-penem to avoid seizure adverse events may offset its potential antimicrobial activity . 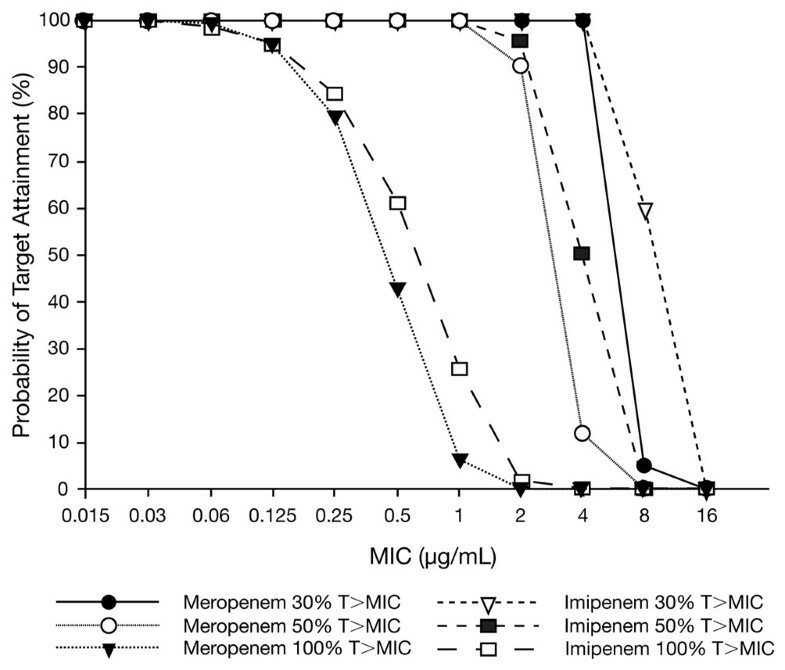 Kuti and colleagues  performed a Monte Carlo analysis to evaluate the probability of a 500 mg/6 hour dosing regimen of meropenem and imipenem to attain three different pharmacodynamic targets over the entire dosing interval (T > MIC 30%, T > MIC 50%, and T > MIC 100%) for different pathogens. 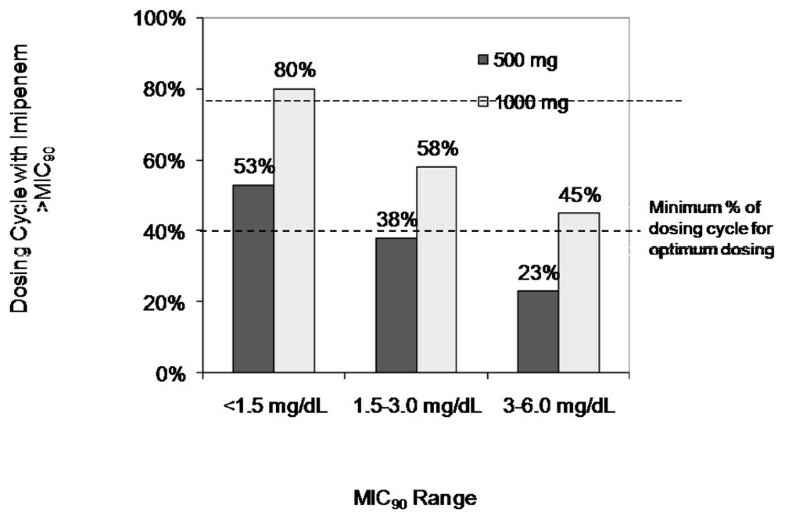 Probabilities of staying above the MIC target throughout the dosing interval were similar between the two agents for T > MIC 30% or T > MIC 50% (Table 2). Figure 1 shows the probability of attaining the dosing targets across a range of MIC values, and while the differences are statistically significant, this calculation does not take into account protein binding differences that affect drug availability, reducing the accuracy of the findings, so the clinical significance is not clear . Nevertheless, the model demonstrates the importance and complexities involved in delivering drugs effectively, taking into account pharmacodynamic properties. T>MIC, time greater than minimum inhibitory concentration. Probability of attaining pharmacodynamic target during entire dosing interval (T > MIC > 30%, 50%, and 100%) as a function of MIC for imipenem and meropenem at a dosage of 500 mg q6h. The 30% and 50% targets represent conservative estimates for bacteriostatic and bactericidal activity, respectively. Each curve shows the likelihood of the drug to stay above the target MIC for the entire dosing period based on the pathogen's MIC. Note the steep declines in probabilities for MIC values between 0.5 and 4. Reproduced with permission from Kuti et al. .
Levels of resistance have increased considerably since the introduction of the first carbapenem, particularly among Gram-negative organisms . Carbapenem resistance among A. baumannii and P. aeruginosa is a pressing problem [2, 24, 44–55] with steady increases in the prevalence and geographic spread of carbapenem-resistant strains [56–58], and reported rates of resistance as high as 16.3% worldwide. In North America, rates of 3.1% for P. aeruginosa  and 3.2% for Acinetobacter spp. have been reported. Between 1997 and 1999 and 2004 and 2006, imipenem nonsusceptibility in P. aeruginosa increased from 23.6% to 29.3% and from 33.3% to 47.5% in Acinetobacter spp. . Resistance in K. pneumoniae has also been reported . For 2004 and 2005, meropenem nonsusceptibility for P. aeruginosa was 9.7% and 12.4%, respectively, and for Acinetobacter spp. was 23.9% and 14.4%, respectively . Three mechanisms for carbapenem resistance development have been identified: reduced carbapenem influx due to changes in expression of outer membrane porins , secretion of carbapenemases [44, 61, 63, 64], and efflux pump production . Studies have suggested that resistance to imipenem may occur through a loss of porin expression alone, whereas with meropenem and doripenem the combination of porin loss together with increased efflux pump production is required to confer resistance [66–68]. Carbapenemases affect all three antipseudomonal carbapenems. At present they are relatively rare in the US; however, carbapenemases are a source for future concern as they inactivate not just carbapenems but virtually all β-lactam based antibacterials. Furthermore, detection of carbapenemases is not well-addressed by current automated testing systems. One study found that clinical laboratory testing mis-identified approximately 15% of carbapenemase-producing K. pneumoniae strains as imipenem-susceptible . A second study evaluated several automated test systems for detection of carbapenem resistance in 15 strains previously identified by broth microdilution as non-susceptible to imipenem and meropenem . Depending on the test system used, between 1 and 13 of the 15 nonsusceptible strains were misidentified as susceptible. Although several methods for assessing carbapenemase production have been proposed [71–74], current guidelines do not include protocols for assaying carbapenemase production. Imipenem and other carbapenems are considered the most effective available agents for treating Acinetobacter infections [75, 76]. However, A. baumannii strains with high-level carbapenem resistance have become widespread . Carbapenem-resistant A. baumannii has been reported worldwide, with outbreaks in the United States , Europe [45, 49, 54], South America , and Asia [50, 53]. A recent Turkish study of patients with postneurosurgical meningitis found that 45% of 29 infections due to Acinetobacter spp. were imipenem-resistant before the initiation of therapy . 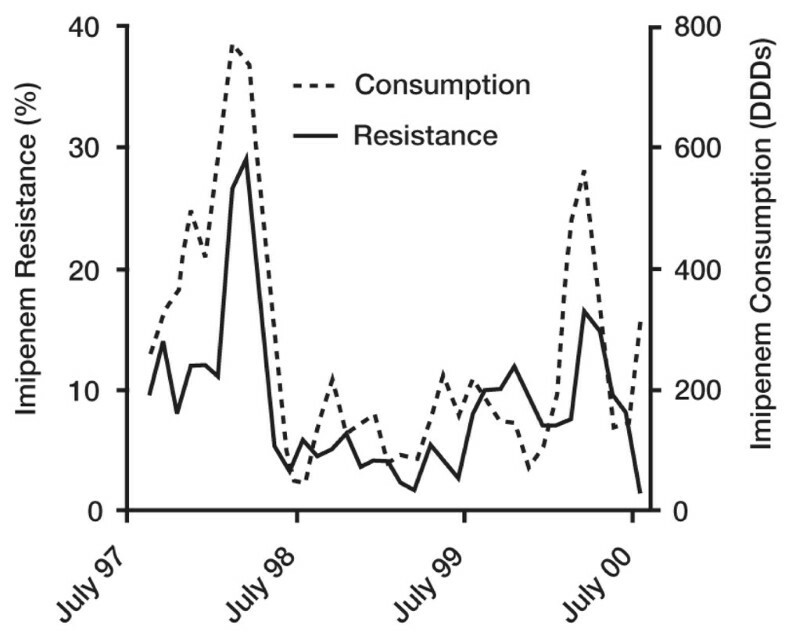 Resistance to carbapenems probably reflects two major drivers: the 20-year history of widespread use of imipenem and other carbapenems, and dosing that is suboptimal for pathogens with higher MICs, including intermediate and resistant organisms. The general association between antibiotic use and antibiotic resistance is well known and believed to be causal . Several reports exemplify this linkage for carbapenems. A study in a 600-bed community hospital found a strong association between imipenem usage and resistance in P. aeruginosa (Figure 2), although it is unclear whether the strain was treated adequately or if infection control techniques were uniformly adopted . In another study, an attempt to prevent cephalosporin resistance by decreasing cephalosporin use caused a compensatory 140.6% increase in carbapenem use and an increase of 68.7% in the prevalence of imipenem-resistant P. aeruginosa infections . Correlation between imipenem usage and imipenem resistance in P. aeruginosa in a community hospital. DDD, defined daily dose. Reproduced with permission from . Similarly, a Polish pediatric hospital in which carbapenem use quadrupled between 1993 and 2002 found that the percentage of isolates susceptible to imipenem decreased from 95.7% to 81.7%, and that MIC90 increased from 2 mg/dL to 16 mg/dL over the same period (Figure 3) . 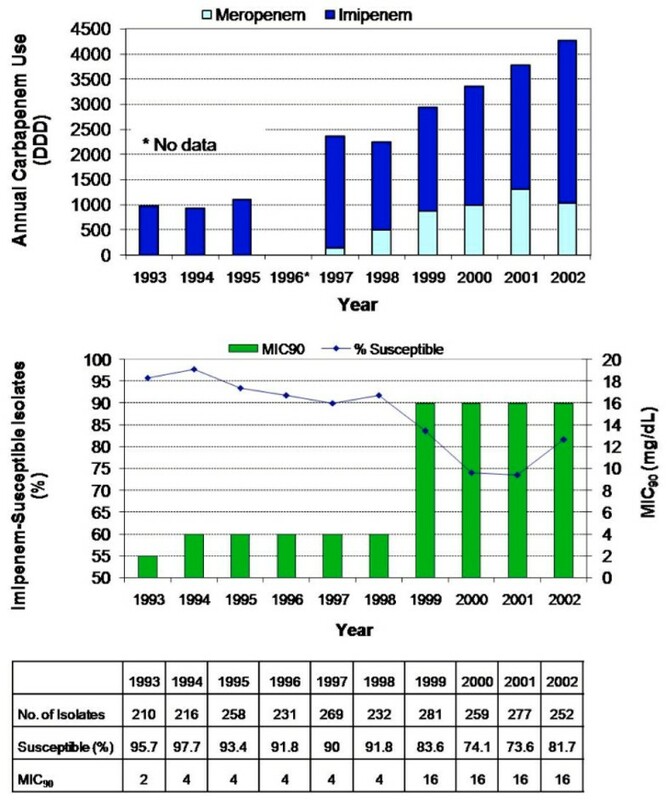 Imipenem susceptibility and carbapenem use at a Polish pediatric hospital (1993 to 2002). DDD, defined daily dose. Reprinted from Patzer and Dzierzanowska , with permission from Elsevier. Suboptimal dosing is a well known driver for the development of antibiotic resistance during antibiotic therapy . As already noted, optimal bactericidal dosing for carbapenems requires maintaining drug levels so that T > MIC exceeds 40% of the dosing interval [26, 81, 82]. The standard 500 mg q6h regimen for imipenem/cilastatin meets this criterion in healthy individuals for susceptible pathogens. However, as shown in Figure 4, the 500 mg q6h regimen provides T > MIC values of 38% and 23%, respectively, for organisms with 1.5 to 3.0 mg/dL and 3 to 6 mg/dL MIC values . Thus, the 500 mg q6h regimen and lower dosages may not be adequate for pathogens with a MIC >1.5 mg/dL. Effect of imipenem dose on the time during which serum imipenem exceeds the MIC90 in healthy volunteers after a 30 minute infusion . The dashed line shows the percentage of the dosing cycle required for optimal dosing. Also of concern is the emergence of resistance during a course of carbapenem therapy. Fink and colleagues  investigated imipenem 3 g/day (1,000 mg q8h) in 200 patients with severe pneumonia. Microbiologic eradication occurred in 59% of the imipenem-treated patients. A total of 44 different strains of P. aeruginosa were isolated from 32 of these patients, and 50% of these strains developed imipenem resistance during the trial. More recently, in a study of nosocomial pneumonia, resistance developed in 33% (nine of 27) of patients with P. aeruginosa infections during treatment with imipenem 500 mg q6h. Resistance was present at the start of therapy in 5 of 32 (16%) patients (5 patients in this group were excluded after randomization) . Use of imipenem as monotherapy to treat P. aeruginosa is not recommended because, as the examples above show, imipenem monotherapy is associated with considerable risk for P. aeruginosa resistance [84, 85]. Intermediate susceptibility to imipenem is common among P. aeruginosa strains, and imipenem 500 mg q6h is frequently unable to achieve a sufficient T > MIC for effective eradication. In a trial comparing imipenem/cilastatin with ceftazidime for serious nosocomial infections, P. aeruginosa infections resolved in only 8 of 19 patients treated with imipenem, compared with 14 of 17 infections in patients treated with ceftazidime (P = 0.004); resistance developed in 6 of 19 and 1 of 17 patients, respectively . Altered carbapenem T > MIC values in an individual patient may also reflect the presence of severe illness, which can affect any pharmacokinetic parameter of a drug [81, 86]. Regimens that do not account for these conditions may not maintain antibiotic levels sufficient for eradication . One example is patients who are anuric or receiving continuous renal replacement therapy. Current continuous renal replacement therapy techniques provide rapid systemic drug clearance, and carbapenem regimens that are not adjusted accordingly may result in suboptimal drug levels, ineffective eradication, and an increased likelihood of resistance . Overall, these considerations suggest that standard carbapenem dosages (for example, imipenem 2 g/day) may be suboptimal in terms of microbiologic eradication and resistance development for some infections in some patients, particularly pathogens with intermediate susceptibility and patients with altered pharmacokinetic properties when doses are not adjusted appropriately. The increasing prevalence of carbapenem resistance has broad and significant clinical implications because mortality and the cost of care are significantly increased in patients with carbapenem-resistant infections. Mortality in patients with carbapenem-resistant infections is approximately twice that of patients with carbapenem-susceptible infections: Kwon and colleagues  reported mortality rates of 57% and 27.5%, respectively, in patients with imipenem-resistant and imipenem-susceptible Acinetobacter bacteremia (relative risk 30-day mortality was 2.019 (95% confidence interval, 1.18 to 3.69; P = 0.007). The primary risk factor for mortality was the use of discordant antimicrobial therapy, that is, when the pathogen was not susceptible to any agent in the antimicrobial regimen . Studies of multidrug-resistant (MDR) P. aeruginosa infections report an odds ratio for mortality of 15.13 (95% confidence interval, 1.90 to 323.13; P = 0.001) for MDR versus susceptible infections in patients with P. aeruginosa bacteremia , and hospital costs for MDR and susceptible infections of $54,081 and $22,116, respectively . In addition, resistance can be transmitted and consequently lead to outbreaks of carbapenem-resistant infections. Mikolajczyk and colleagues  estimated that 45% of imipenem-resistant P. aeruginosa infections result from transmission. Multiple outbreaks of carbapenem-resistant A. baumannii and P. aeruginosa have been reported, including a major citywide outbreak that occurred in 15 Brooklyn, NY hospitals in 1999. During the outbreak, carbapenem resistance was found in 53% of A. baumannii isolates and 24% of P. aeruginosa isolates. Approximately 400 patients were infected or colonized with a carbapenem-resistant strain . Multidrug-resistant A. baumannii and P. aeruginosa are now endemic in the New York area, and the production of carbapenemases is increasingly common in K. pneumoniae and E. coli [56, 58, 69]. The increasing prevalence of imipenem resistance may also affect dosing requirements. In the past, before the emergence of MDR organisms became a common problem, the clinical impact of regimens using low imipenem dosages was relatively minor. With the emergence of MDR P. aeruginosa and Acinetobacter spp., inadequate dosing is increasingly likely to affect outcomes. Although it is possible to prevent and control these outbreaks using a variety of measures such as patient screening and isolation, resistance monitoring, and infection control procedures, it is prudent to take measures to prevent or slow the development of carbapenem resistance. Possible approaches to managing the problem include the use of novel dosing regimens, including extended infusions [92–94] and the use of novel or alternative antibiotic agents. Regimens using longer infusion times may help ensure that drug levels are maintained above the MIC90 for at least 40% of the dosing interval. Alternative antibiotic agents could include novel agents, carbapenems or other agents, and combination therapies. Alternative agents can be evaluated by the criteria put forth by the Council for Appropriate and Rational Antibiotic Therapy (CARAT). These criteria include the strength of evidence supporting the use of the antibiotic, the expected therapeutic benefits and the possibility of resistance, the adverse-event profile, the cost-effectiveness of therapy with the agent, and the appropriate dosage and duration . Cost-containment strategies may have to be adjusted to maintain adequate carbapenem dosing. Greater awareness and education regarding MDR pathogens and carbapenem treatment issues across hospital departments remains a vital need. Imipenem and meropenem have been a useful part of the antimicrobial armamentarium for 20 and 10 years, respectively, and continue as valuable agents for treatment of Gram-negative infections. However, they have a narrow therapeutic window and the need for low-dose therapy to avoid neurotoxicity and the need for high-dose therapy to ensure efficacy and prevent the development of resistance are in constant conflict. It is not yet clear whether an optimal antimicrobial dosage is attainable, given the seizure risk, or a suboptimal dosage acceptable, given the risks for treatment failure and resistance development. While avoidance of seizure adverse events may limit dosages – for example, imipenem 2 g/day or less (adjusted as necessary for renal dysfunction and other conditions) – these dosages are likely to be suboptimal for treatment of infections involving P. aeruginosa, A. baumannii, and other organisms with intermediate susceptibility. Underdosing may well decrease the efficacy of therapy while increasing the probability of resistance development. Solutions include increasing awareness of treating resistant organisms, utilizing optimal dosing regimens in areas of the hospital where multiresistant organisms are more likely encountered, using alternative antimicrobials with more favorable pharmacokinetics, pharmacodynamics, and adverse-event profiles, and using newer carbapenems with lower propensity for resistance development (for example, reduced expression of efflux pumps or greater stability against carbapenemases). Achieving success requires hospital systems and physicians to continue to work together to create clinical solutions that optimize patient care. The author would like to acknowledge Ben Caref, PhD (The Falk Group, LLC, New York, NY), who provided medical writing and editorial assistance. Ortho-McNeil® provided financial support for this assistance. TGS has been a consultant for Ortho-McNeil®, Division of Ortho-McNeil-Janssen Pharmaceuticals, Inc. and is a member of the Speakers' Bureau for Pfizer, Inc. and Ortho-McNeil®. TGS has not received research funding.